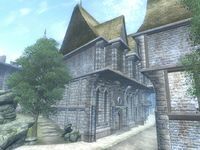 Lazare Milvan's House is located in the northern section of Skingrad, next to Nerastarel's house and across the street from All Things Alchemical. 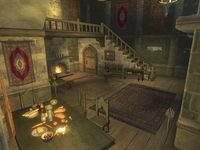 As befits his status, Lazare owns a rich and spacious manor. The first floor serves as dining room, where the table is spread with delicate food and silverware. Two bottles of Surilie Brothers wine and one bottle of Tamika's West Weald wine are found about the room. The cupboard to the left of the fireplace holds a bottle of Surilie Brothers Vintage 415. However, a chest and a dresser to the right of the front doors hold only clutter. The locked door in the stairwell leads to a large basement complete with a bearskin rug. The usual food and clutter are about, but a large wine rack holds five bottle of Surilie Brothers and nine bottles of Tamika’s. A rather unusual and very powerful rat (see notes) has taken up residence in Lazare’s basement. There is an inviting looking chest in the north section of the basement, but it holds only clutter. The landing between the two floors has a small sitting area. Four more bottles of Surilie Brothers are here. Some silverware and books are on the shelves, and the chest of drawers contains nothing of interest. At the top of the stairs, facing north, is a promising looking storage loft with a chest. However, the chest only contains some clutter and a wolf pelt. Lazare's bedroom is behind a locked door. Like the rest of the house, the bedroom furniture contains the usual food and clutter. A wine rack just to the left of the door holds five more bottles of Surilie Brothers wine, and two more bottles are found in the room. Next to the wine rack is a cupboard with a locked jewelry box on top, which unsurprisingly contains jewelry and has a small chance (10% each) of containing a potion or an enchanted jewelry piece. 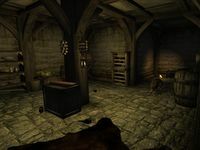 On the far side of the room a large bookshelf holds various pieces of upper-class clothing and the valuable book Provinces of Tamriel. 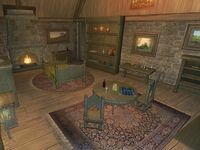 Next to the bookshelf is a desk with nine gold coins, two empty petty soul gems and a bottle of Cyrodilic brandy. The adjacent open cupboard displays a collection of swords: an iron longsword, a steel dagger, a steel shortsword, a steel longsword and a silver shortsword. 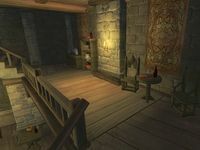 Lazare's basement contains a leveled and unusually strong rat. The damage it deals and its health increase drastically with your level, and it moves very fast. Unlike standard rats, it is not a member of the Creature faction and therefore may possibly not attack you on sight. There is no apparent reason for the rat's presence in the basement. In the Construction Set, this rat is identified as TestBasementRat, and therefore may have been added for testing purposes and never removed. Esta página foi modificada pela última vez à(s) 20h10min de 5 de julho de 2015.